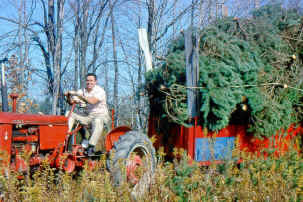 "In 1958 three young men and myself from Buffalo, NY decided we could "get rich" growing and selling Christmas trees. So we bought 151 acres of land for $3000, a second-hand tractor and planter, and went to work. Over 3 years, 90,000 trees were planted. By the time they were big enough to sell, there was a national glut on the market. After several years of selling just enough trees to pay for pruning and other expenses, we gave up and let the trees "go back to nature". But I still liked the idea of Christmas trees. In 1969 I was living in Dansville and began planting some trees on property my wife and I had bought from her father. We sold our first trees in 1979. The farm has now expanded to over 90 acres, with over 35 of them planted with trees. For a few years people paid for their trees at our kitchen table. Then we bought a cash register and set it up in the barn's doorway. And we needed to use up our extra Scotch pine trees so wreath making began then too. The next year we moved the tools out of the woodshop and put the cash register there. We decided that we might as well try to sell a few ornaments too. Prices started at $.19. A small Christmas village from our home had been expanding so it was moved to the shop. In 2004, we had outgrown the woodshop and we built a 50' by 80' barn for a gift shop and tree processing area. 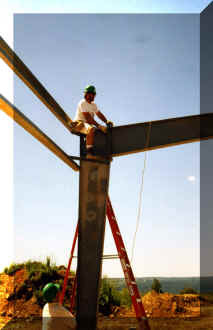 The cement floor and roof were contracted out but all the other construction was done by us, primarily by Frank III, that's him up there on the girders. So that's where we are.